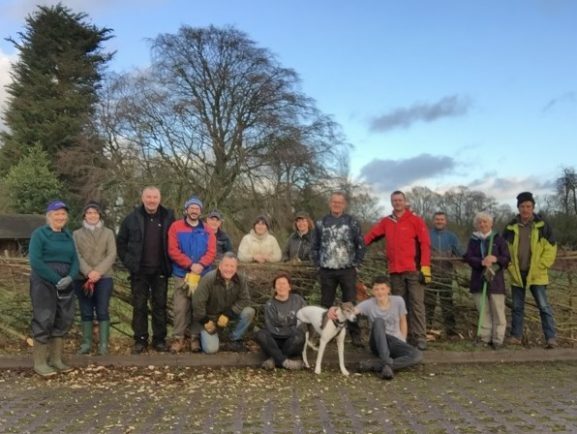 AN ENTHUSIASTIC group of volunteers took part in a hedge-laying project at Tardebigge Community Hall. It followed on from the impressive Tree O’Clock project in December 2009 when the Community Hall’s team helped set a new Guinness World Record for the most trees planted within one hour at multiple locations. That project was carried out in collaboration with the BBC’s Breathing Places team and other partners, including the Woodland Trust. 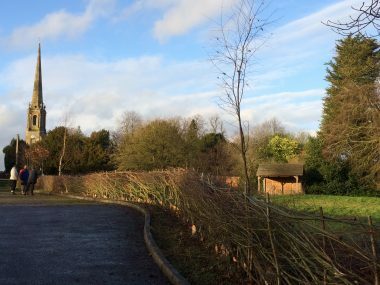 The mixed hedge of traditional English plants, including field maple, hazel, beech, hawthorn, dogwood, guelder rose and blackthorn along the length of the hall’s car park (around 75 metres) made an elegant screen and a wonderful habitat for small mammals and birds. But in 2016, during a working party, the committee decided it needed re-laying. The area’s tree officer Andy Bucklitch was consulted and suggested it be left a couple of years and then be relayed. The group investigated the cost of it being laid professionally but it would have been expensive so they enlisted the help of Worcestershire County Council’s Countryside Officer Wade Muggleton. He trained the team and provided the tools to start the initial hedge-laying earlier this year. Then last month he returned and the group were able to complete the job. For more on the hall, visit tardcomhall.org.uk or call the booking officer on 07763 446902. Email Lucy at ljparkes@btinternet.com for future indoor and outdoor projects.